The Stanley Picker Gallery was awarded one of Kingston University’s Opportunities Fund grants to devise and pilot Future Shape, a special programme of educational events and workshops that coincided with the BA Fine Art Degree Show 2011, part of which was staged at the Gallery. The Fund is designed to help get new projects managed by staff and often led by students, off the ground, to provide a positive and lasting impact on student experience at Kingston University. 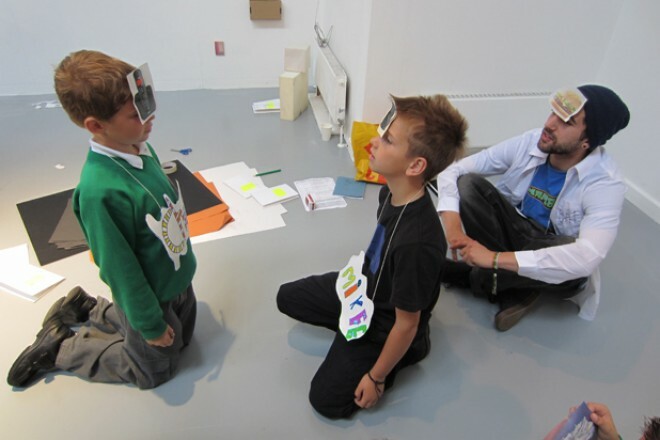 During the Future Shape programme, graduating Fine Art students worked alongside Gallery Education Coordinator, Natalie Kay, to learn how to plan and deliver art-based workshops to local school pupils, inspired by the Degree Show and their own art practices. Participating schools were Chandlers Field Primary School (Years 5 & 6) and Green Lane Primary School (Year 5). Pupils were divided into small groups and, each of these then partnered with a different student artist and artist assistant. The teams worked together to create new artwork inspired by the artists practice and degree show piece. A public exhibition of the final works created by all groups from both schools was held at the Stanley Picker Gallery (23-27 June 2011). Participating 3rd Year Fine Art Students: Amy Hodgins, Georgia Jones, Harry Laskowski, Amelianne Monk, Steve Nice, Jim Robertson, Maya Schueller-Elmes, Polly Turner, Dai Williams, Joe Wilson and Rebecca Wilson.